Day in, day out, people see the same bottles standing on the supermarket shelves. Captain Morgan is calling on us to break the monotony and make everyday shopping more interesting. We need you to design an extraordinary limited edition pack for Captain Morgan’s famous rum. A pack that is so arresting, clever and mischievous (like the Captain himself!) that customers will not only want to buy it but tell all their friends about it too! Captain Morgan gives his name to the original spiced rum; but more than that, he is the one and only “Captain”. The Captain is a hero history remembers: he was the fearless raider of boredom, the riotous leader of living and a man who led with his heart. He showed his crew a life more legendary. Young men everywhere aspire to join an epic and legendary adventure with Captain Morgan. A challenging and extraordinary limited edition pack for Captain Morgan’s rum could be the start of this adventure. Shipmates! Captain Morgan wants you to design a limited edition pack for his famous rum that will rock the supermarket shelves and get everyone talking! Hurry up and start creating now! 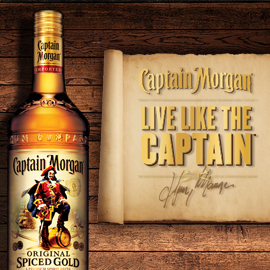 Captain Morgan Limited Edition contest will be running until September 10, 2013. Let's go help the captain!